Watch out for Merlina — she'll steal your lunch with no regrets. At 7am, the Tower of London is peaceful — no tour groups, just distant traffic noise, and if you believe the legends, a ghost or three. Except in one corner, where there's a large, luxurious wood-and-wire enclosure that contains some very hungry ravens, hopping and croaking as they spot Christopher Skaife approaching with breakfast. Skaife is the Ravenmaster — one of the Tower's famous uniformed yeoman warders, his particular job is to take care of the seven resident ravens. Because of course, as legend has it, if the ravens ever leave the Tower, it will crumble to dust and a great harm will come to England. Luckily, Skaife tells me, these particular ravens are disinclined to leave; they want to stay where the food is. "What would you like," he coos to them, "would you like some mice?" Breakfast of champions: A plastic bin full of slightly gory mice and a choice rat or two. Skaife says the ravens often bury their food and come back to it later — and they're particularly partial to eating all the tasty soft bits of a rat, leaving just the head and hide, which he refers to with delighted disgust as a "rat-skin rug." He's been on the job for a while by the time I turn up, making sure yesterday's tours and events haven't left any dangerous debris around the Tower that might harm his charges. And he's trying to explain his precise morning routine to me, but we keep getting interrupted by hungry ravens. At one point, Skaife turns around and yells "I'm telling this story, not you!" Skaife tells that story — no hungry ravens to distract him — in a new memoir, The Ravenmaster, all about his life and work at the Tower. There are seven ravens living here right now: Dominant pair Erin and Rocky, three younger males — Gripp, Harris, and Jubilee — Poppy, the baby, and Merlina, the queen, who has her own domain in one of the Tower's historic houses. This is a royal palace, even now, so the Tudor-era Queen's House hosts the Tower's royal representative — and Merlina, who graciously shares it with him and his family. After the other six have tucked into their mice, we spot Merlina hopping along the green towards us, ready for her share of breakfast. Skaife and Merlina have a special bond; I stand well back while he gently pats her on the beak and she gurgles and croaks in response. Sometimes, he'll try to talk to her in clicking, knocking noises that he calls "ravenish," and sometimes, she talks back. Sometimes. This morning, though, she's magnificently ignoring both of us — except when the bin of mice is in sight. Skaife says ravens can be extremely smart, and Merlina is among the smartest. She's fond of pranking visitors by stealing their snacks, or when she's especially bored, playing dead (to the shock of the occasional visitor who gets taken in by her act). But she doesn't do tricks on command — while there have been ravens in the past who could croak out a few words in English, Skaife says he's committed to keeping these ravens as wild as possible. So you won't hear a "Nevermore" echoing across the green — and Merlina and her colleagues are surprisingly free to fly around. "There are legends and myths associated with the ravens. I am the Ravenmaster, I don't want the ravens to fly off, otherwise I'll be out of a job. So what I actually do is that I'll trim up the odd flight feather or two." But he doesn't truly clip their wings — and he doesn't like the term "clipped." That's occasionally led to some precarious situations. "I have, as the Ravenmaster, on one occasion — or maybe two or three — swung on the spire of the tower up there, trying to catch a naughty raven," he says. Indeed, later on we spot Merlina in her favorite perch high atop one of the Tower's towers — accompanied at a safe distance by Jubilee, who's showing some signs of being sweet on her. Now, about those myths. The official line is that the ravens have been around for hundreds of years, and were officially installed by King Charles II, perhaps for a bit of luck after London was hit by a one-two punch of plague and fire in the 1660s. "Unofficially," Skaife says, "the ravens haven't been here that long. We can't really date the evidence of the ravens back any earlier than the 1880s, so that would make it kind of a later Victorian myth. So what we kind of think is that the ravens were brought in because the ravens were made popular by Edgar Allan Poe. And ravens were popular to have as pets — Charles Dickens had a pet raven as well, in fact, he had three pet ravens." 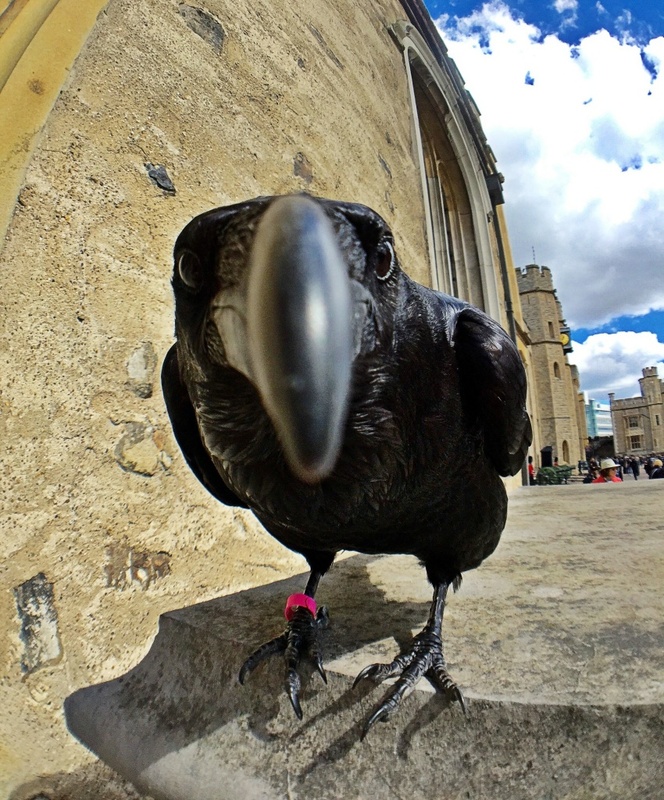 What better way to get tourists to the Tower than to set a few ravens around its famous execution grounds, and start telling creepy stories about them? Skaife himself is an unending fount of raven lore — not just myths and stories, but habits, personalities and discoveries he's made over his years on the job (you can find some great stuff on his Instagram account). "I never get bored of watching what ravens do and how they go about their lives," he says. "They're just incredible. You just never know what they're going to do, so you've always got to be on your toes when you're looking after them."